I had debated doing something like that before I realized that I could use the pants hangers. 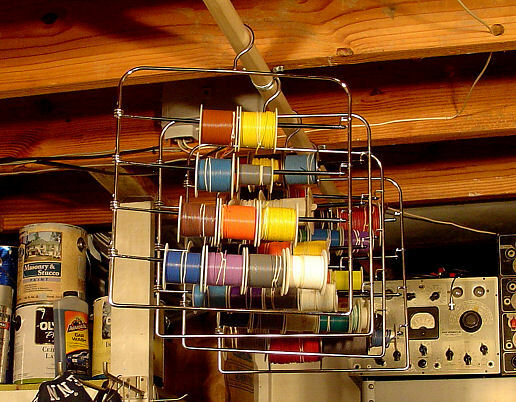 Elastic bands keep the spools from unreeling, and it is now much faster to find the exact wire that I want. I have a few more pants hangers in reserve and the dowel is long enough to hold them, so I have room for expansion. It looks like Mark and I share the common problem of more stuff than we have places to put it, which always leads to interesting solutions. One space-saving solution pretty much fell into my lap. My Tektronix 453 oscilloscope has lived at the right side of my bench for nearly twenty years, taking up more real estate on the bench than was justified by its infrequent use. A friend was downsizing his shop last year before moving and gave me a bunch of stuff, including his 'scope cart. He had a Tek 422 on it, which is significantly smaller than the cart he was using. Since the bench in his new house is larger than his old bench he put the little 422 on it and gave me the cart. It is a Tek 200-1 cart, designed specifically for the Tek 453 and 454 'scopes, so it is a perfect match for me. The cart is stored out of the way between two shelving units and rolled out when I need it. BTW, I could help you gain some more space by getting those Chanalysts out of your way, especially the Meissner. Thanks for sharing the idea. It's always interesting to see how others solve problems. It took me long enough to get the Chanalyst, the Analyst, and the Traceometer. Even though I don't use the first two (I do use the Traceometer) I still like them as shelf queens, or should that be as rack queens. I understand the problem, believe me. The problem with shelf queens and storage space is that more is never enough. I'll stop hijacking the thread now. Why two General Radio microvolters? IM distortion measurements? Or just because they look neat? What's the meter with the engine-turned front panel, second from the left on the bottom row? Is it a Philco? The meter style looks like a Balantine. And what's the left-most one on the bottom row? Why two General Radio microvolters? One is awaiting restoration, the other is a parts junker with a bad meter. It is a Hickok 202NX VTVM - I still need to get a manual for that puppy. A GR 1216-A Unit IF Detector, used as part of the detector system for the GR 1602-AB UHF Admittance Meter, which is housed in the factory wooden case sitting on top of the 1216-A. 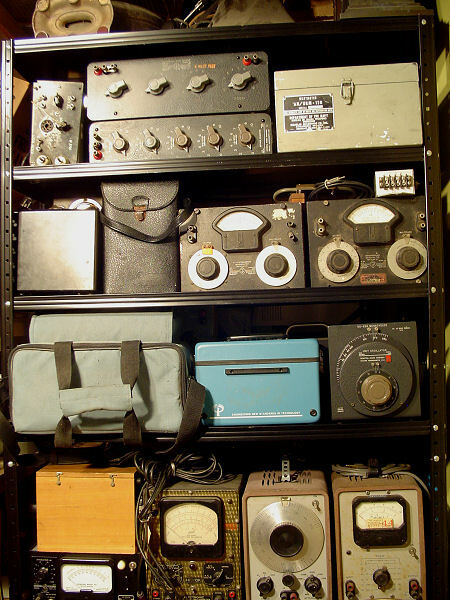 I didn't have enough room to back up far enough to show the bottom shelf, which houses, among other things, a GR 1201-AU UHF Standard Signal Generator, a TIC 310-A Z-Angle Meter, and a Ballantine 700 Sensitive Inverter, for which I also need a manual. Thanks Dale. The Hickok is an attractive VTVM. I should have recognized the GR 1216. Mine has the new style meter. I should have recognized the GR 1216. Mine has the new style meter. The first catalog showing the new 1216-A meter was the 1961 Catalog Q.